A mass fatality incident may be caused by natural hazards (earthquakes, floods, hurricanes), accidental disasters (airline crashes, bridge or tunnel collapses), pandemic outbreak or by intention (acts of terrorism, mass shooters). Therefore, mass fatality response planning should be based on a scalable plan that can be tailored to any specific situation. The purpose of this template is to provide a framework for an organized and effective response to a mass fatality incident specifically regarding identification and disposition of deceased individuals. It provides a structure for coordination and communication among multiple agencies and organizations to provide efficient and effective mass fatality management. 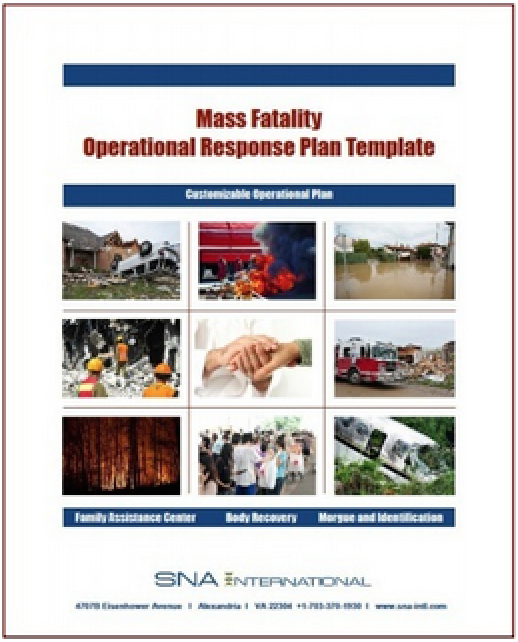 The Mass Fatality Operational Response Plan Template is an easy and inexpensive tool for communities to use to begin the process of planning for a mass fatality. This type of incident results in an overwhelming number of deaths and stretches local agencies and available resources. The 300-plus page customizable template outlines the operational response. It also comes with five hours of SNA International consultation hours ($875 value) to help communities as they plan for the worst-case scenarios. Recovery of the deceased is the first stage in the identification process. There will be tremendous pressure from surviving family members, public officials, the media and others to rapidly recover and identify the deceased following a mass fatality incident. Our template outlines the operations required for the efficient and effective recovery of remains, including scene evaluation and the tasks associated with forensic body recovery. Incident Morgue (IM) Operations following a mass fatality are very different from the normal day-to-day flow of operations typically performed in a morgue. The template outlines which forensic specialties will be needed, the size and infrastructure requirements of the morgue itself, ancillary support needed, and other specifics required to establish a morgue operation that meets the unique requirements of a mass fatality response. Mass Fatality Family Assistance Center (MF FAC) Operations are often the most misunderstood aspect of a mass fatality response. Since this is the portion of the response that interfaces with the public (families), it is critical that all participants of the MF FAC understand the operations and their roles and responsibilities. The public will judge the entire mass fatality response by what occurs in the MF FAC. Our template details logistics and staffing, security, reception of families, support services, call center, intake, record management, information technology, collection of ante mortem information, family notification and body release. Victim Identification Operations coordinate the identification of human remains. The ultimate goal of any mass fatality response is the identification and reunification of the deceased with their surviving family members. Our template outlines the generally accepted guidelines for human identification. It also outlines the collection and comparison of antemortem and postmortem information for making identifications. Our customizable template is ideal for communities that already have a plan or partial plan in place. At the operational level it will strengthen and complete existing plans. It is designed to go from the shelf to the response and provide guidance, job actions, and forms. This template can be a next step in expanding current plans. The template may be purchased in its entirety or in individual sections: body recovery, Family Assistance center, morgue operations and identification, and hospital/healthcare roles and responsibilities. When A Mass Fatality Happens In Your Jurisdiction, Will You Be Prepared?